Philly Port Expansion Designed for Panama Canal Traffic - American Supply Co.
As the years have gone by, it is basically understood by most Americans that a majority of the products we use every day are not produced in the United States. The same applies to a lot of our fruits and vegetables, as well, with many of them not grown within our borders. The reason that many of us may not think about these facts is that this food and the products we use daily are always there right in front of us, but in reality, these objects take a long journey. If you live in Pennsylvania, or in many locations throughout the Northeast and along the East Coast, there is a chance that you have seen these items – some 6.09 million metric tons of it, according to the Central Penn Business Journal – coming in via the Port of Philadelphia. With all of this merchandise coming through our borders, you better believe that expansions are necessary, and that is exactly what the port officials are doing. What may be more surprising though is the driving reason, which is located more than 4,500 miles away – the recent widening the Panama Canal. With larger vessels now capable of traversing the canal, port officials are seeking to not only expanding the waterway, but also to increase its depth. The next large project includes deepening the waterway from 40 feet to 45 feet, helping allow even larger vessels into the port. Think that is a simple task? Think again. This project, which is currently under way, cost $353 million and is almost complete after nearly eight years. When the depth improvements are complete, the Philly port will be able to accommodate “Neo-Panamax” vessels, making it among the first U.S. ports on the East Coast capable of handling the larger boats. These improvements at the port, among many other additions, are going to increase the productivity of the port by leaps and bounds. Authorities are very optimistic about what these changes will bring, with hopes that the port expansion will create many money making opportunities for the entire state of Pennsylvania. Plus, being able to complete these improvements ahead of neighboring ports in Baltimore and New York City, gives the port a strategic advantage and makes it a more appealing destination for international businesses. As a proud Philly business, we at American Supply Co. are thrilled about the exciting changes coming to our region within the upcoming years. With all of this new merchandise and produce coming through, businesses are going to need somewhere to store it, and our warehouse solutions are just the ticket. 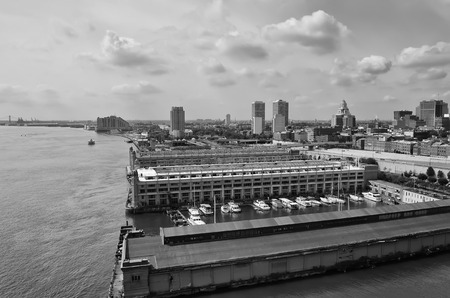 With convenient locations near the Philadelphia ports, our warehouse and distribution services can help you store and transport your goods to wherever their final destination may be. To learn more, give American Supply Co. a call today at 877-274-8859.